Last week the Federal Reserve raised short-term interest rates by 25 basis points. It was the first rate hike in 2016 and only the second since 2006. This move was widely expected, especially in light of the increase in rates following the results of the 2016 election – most notably, approximately a 70 basis point increase to the 10-Year Treasury rate. The impacts on healthcare real estate decision making are already being felt by owners and healthcare providers. While cap rates remain close to their historically low levels for now, rising rates have placed upward pressure on cap rates resulting in downward pressure on valuations. 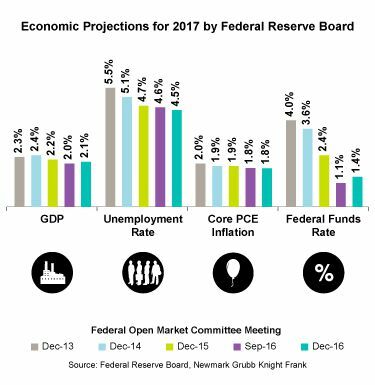 Owners and healthcare providers contemplating monetization should accelerate that decision soon, especially in light of potential future rate hikes in 2017 as well and the potential for significant fiscal stimulus in a Trump Administration. For hospitals and health systems, rising interests and the potential for increased inflation place additional upward pressure on borrowing costs and occupancy costs, placing further downward pressure on operating margins. Providers that are considering locking in their real estate occupancy costs under longer-term leases and have the opportunity to do so need to consider how inflationary pressure potentially leaves them exposed to a significant increase in rental rates when leases expire in the near-term. In either scenario, the window of opportunity to facilitate the optimal outcome under favorable market conditions with respect to healthcare real estate may be coming to a close. It is critically important for decision makers to fully take into account the brave new world that we’re all now living in.